Cape Town, South Africa has moved up its predictions for when the city will run out of water, with officials now saying they will likely have to shut off the taps in early April. The city’s economy, which relies heavily on tourism and agriculture, could take a big hit. Residents, politicians, and credit raters are all worried about conditions of anarchy if “Day Zero” arrives. 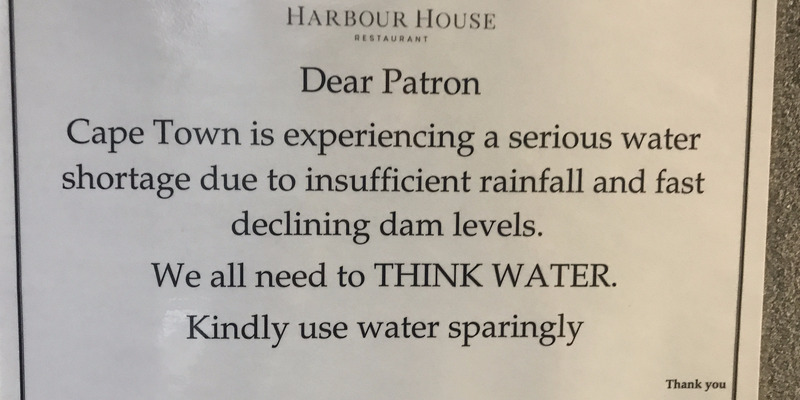 Cape Town is on track to turn off the faucets earlier than anyone predicted. The coastal city, one of Africa’s most popular tourist destinations, is grappling with the worst drought conditions it has faced in over a century. City dams are now 27.2% full. When they reach 13.5% capacity, the city says it will be forced to move to a bucket-brigade-style system of water distribution. Credit raters, politicians, and scientists are all voicing concern about what will happen if the city becomes the first global hub forced to shut off its taps. On Monday, Moody’s Investors Service issued a report predicting that the impending move to ration water would deal a major blow to Cape Town’s economy. “Two of Cape Town’s main industries, tourism and agriculture, are likely to decline, reducing employment, gross value added and tax income,” the report says. Last week, Cape Town officials announced that the day when they will have to shut off the faucets, which they’re calling “Day Zero,” has been moved from April 21 to April 12. 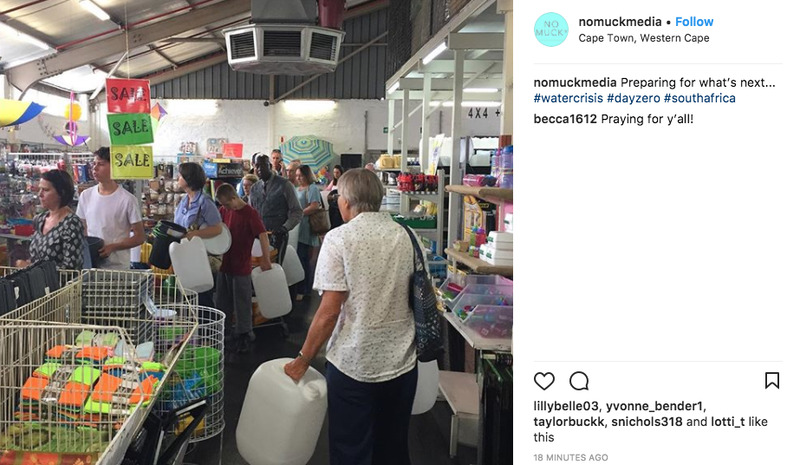 If that happens, the only way Capetonians would get water from the city would be through a pre-industrial-style network of 200 water distribution points. People would have to line up at taps around the city to collect an allotted 25 litres of water each day, then haul it home to shower, clean, flush, and do everything else that requires fresh H2O. Moody’s warned that situation could lead to chaos in the streets of the scenic, mountainous city. Videos posted online show hundreds of people lining up for hours, waiting in the dark to collect water at taps set up by breweries that normally bottle beer. Private hotels are working to bring pricey desalination plants online as the city struggles – in vain – to get people to use less water. Can the city’s residents cut back in time to avoid a shut-off? Western Cape Premier Helen Zille has asked South African President Jacob Zuma to declare a national disaster for the city. Cape Town would need more police and military personnel if Day Zero arrives, she said, in order to defend water storage facilities and deal with disease outbreaks as sanitation worsens. “I personally doubt whether it is possible for a city the size of Cape Town to distribute sufficient water to its residents, using its own resources, once the underground water-pipe network has been shut down,” Zille wrote earlier this month in the Daily Maverick. She also said officials hope to store some emergency water at military bases. Cape Town resident Nomthandazo Seti echoed that sentiment, telling the Daily Maverick that she doesn’t think everyone’s ready to cut back. Efforts to get people to cut back on water usage haven’t been working. The city has been urging every resident to consume less than 50 litres of municipal water a day, and to collect what they use when showering and hand washing and re-use that “grey water” to flush toilets and water plants. But just 41% of residents are using 87 litres or less a day, according to the city, and many are consuming more water at home, not less, as the crisis wears on. Cape Town resident Karen Dehning told the Daily Maverick that she uses more than 87 litres a day because she has to spray down her monkeys when it’s hot out. She also said she’s “too conscious when it comes to cleanliness” at home. Capetown, a city of 4 million, welcomes more than 1.5 million tourists a year, Deutsche Welle reports. The beach and sea-sport haven is also a short distance from safaris and wine excursions. Restaurants and hotels are asking tourists and visitors to do their part to conserve. At the One & Only Cape Town hotel, the staff removed bath plugs and started using recycled, filtered water in the pool. They have also installed water-saving shower heads and are encouraging guests at the five-star resort to “save like a local” and keep their showers to two minutes or less. Some hotels are spending hundreds of millions of dollars to install their own off-grid desalination plants so they can turn ocean water into a usable drinking and washing source. 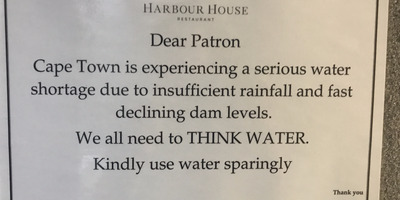 University of Cape Town climate researcher Piotr Wolski said in a January blog post that the three-year-long drought is “very rare and severe” and his statistical analyses suggest a drought this bad should occur only once every 300 years. Meanwhile, city officials are holding out hope that they can avoid “Day Zero” if consumers shift course and cut their water usage. But many residents have started to stock up on water, just in case. 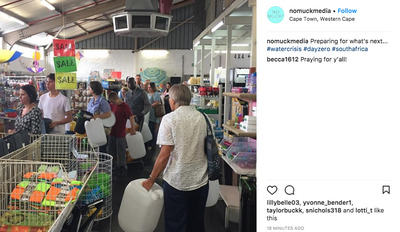 Pictures posted on social media show lines of shoppers lining up to buy industrial-sized water jugs.